You don't need to sew to make stylish new curtains. If you're interested in redecorating, there are plenty of ideas for no sew window treatments that incorporate your favorite crafts. If you can't sew, but enjoy making beaded jewelry, designing your own beaded curtains can be a fun way to add a splash of color to your windows. Although they are a longtime favorite among teens and young adults, beaded curtains can work well in a variety of rooms. Measure your window or doorway to make sure the curtain rod is the right width. Divide the rod into equal parts using your ruler and pencil. Screw in the eye hooks at the points you have marked. Cut your beading thread into pieces that are approximately two inches longer than the desired length of your curtain. The standard curtain length is 75 inches, but you can adjust this measurement if you wish. Tie a strong knot in the bottom of your thread. Add a bit of clear nail polish to the end of the knot for reinforcement. String your beads into the desired pattern. 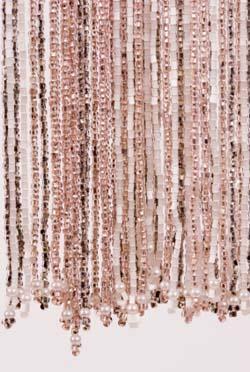 Check out this beaded curtain at Art Bead Scene for a pattern idea if you're having trouble getting started. After stringing the beads, tie a knot in the top end right next to the last bead. Leave two to four inches of thread to make a loop for hanging. Add the eye hooks to the curtain rod. Attach your completed bead strings to the eye hooks by making a small loop at the top of each strand. Place the curtain rod onto the bracket. If you're interested in scrapbooking, card making, or rubber stamping, you probably have a large assortment of leftover paper from previous projects. Put these scraps to good use by designing a unique decoupage window shade. Prime the canvas if necessary. Apply Mod Podge to the primed side of the canvas using your foam paint brush. Add patterned paper scraps, magazine clippings, and/or family photos. Smooth out air bubbles with the rolling pin. Apply a coat of Mod Podge to the top of the surface to seal and protect it. Allow to dry completely. Use hot glue to apply decorative trim around the edge of the canvas. Hang your shade on the spring-tension curtain rod. The book No Sew Fabric Decor: Transform Your Home without Sewing a Stitch by Pamela J. Hastings also has a number of useful ideas for simple no sew window treatments. Whether you're redecorating your bedroom or looking for an easy way to perk up a tired looking kitchen, LoveToKnow Interior Design is your source for information about creating a stylish and attractive living space.